Tom Hunter and Dean Cammy Abernathy congratulate the 2016 scholarship recipients. The Thomas O. Hunter Leadership Scholarships are annually awarded to engineering undergraduate or graduate student leaders. Tom Hunter is an active chair of the Engineering Leadership Institute Advisory Board. He spent his entire career at Sandia National Labs, and was serving as its president when he retired in 2010. He’s still very much involved in advising and lecturing on issues of national safety, energy and nuclear non-proliferation, as well as promoting the importance of leadership in engineering. 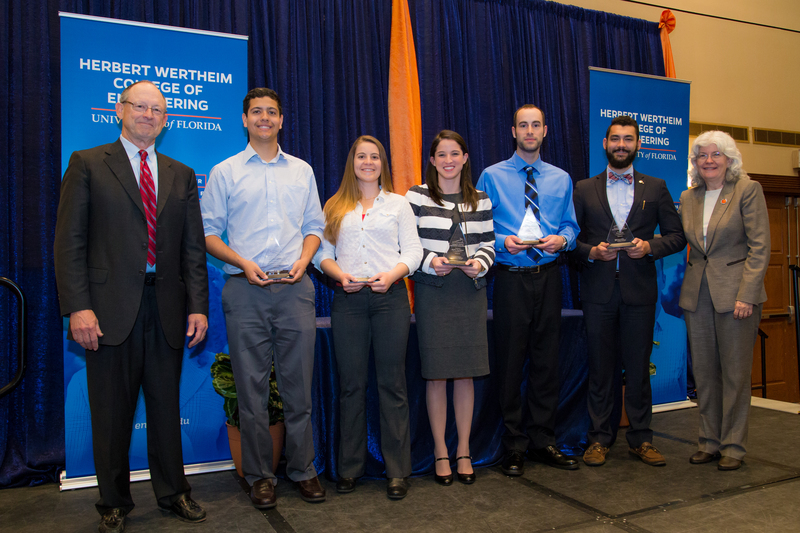 Dr. Hunter has made a gift to the Herbert Wertheim College of Engineering to continue to recognize those who have displayed merit in the area of leadership. The Hunter Leadership Scholarship Awards are intended to highlight and award those who have displayed exceptional merit in leadership activities and academic scholarship. Departments are encouraged to establish a process to nominate one or two students with demonstrated leadership. Minimum 2 years of University leadership experience in the Herbert Wertheim College of Engineering or otherwise (office or executive board of a student society, student group, student council, student government). Demonstrated dedication to the community around them (i.e. peer advisor, campus tour leader, volunteer, etc.). The scholarships are for use towards tuition/fees unless the student has received scholarship/fellowship or other funding sources maximizing tuition/fees expenses. In that event the funds will be allocated to the student without restrictions. Herbert Wertheim College of Engineering students. Junior and senior undergraduates, graduate and Ph.D. students. Students with good academic standing. Call for nominations begins in the beginning of each Fall semester. Please check in with staff at the Engineering Leadership Institute for a nomination form. Nomination by department chair, graduate coordinator, graduate staff, undergraduate coordinator and/or undergraduate staff. Maximum of two nominations per department. All faculty and staff should collaborate for department nominations. Departments nominating two students should rank the students as their first and second selection choice. One faculty letter of recommendation in support of the nomination. Demonstrated financial need. Domestic students (U.S. Citizens, Permanent Residents) complete the FAFSA for official determination by Student Financial Affairs. International students complete the SFA Determination of Need Form for official determination by the nominating department. Selection Process: The Engineering Leadership Institute will assemble a selection committee to review department nominations. The review and selection will be completed towards the end of the Fall semester. Scholarship funds are available for use for the following Spring term.